Asiago derives its name from a small town in northern Italy. In Italy, Asiago usually means fresco (fresh), which has a mild flavour and soft texture. In Wisconsin, cheesemakers age Asiago to develop sharper flavours. It resembles a cross between sharp white Cheddar and Parmesan. Aged Asiago is more crumbly. 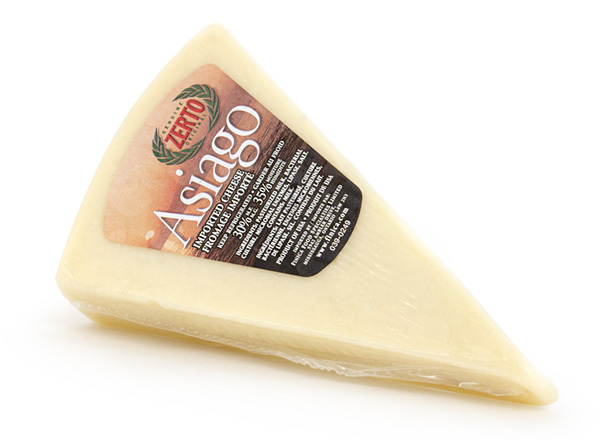 Traditionally, the colour of the wax on Asiago indicates flavour: clear or white suggests mild; brown suggests medium; and black suggests aged. Excellent on any Italian dish, such as pizza or pasta. This is a delicious replacement for the usual recipe utilizing mozzarella. The product has also gained popularity in bread recipes.